We are providing clients high quality custom hologram film and custom holographic film solution foils of International standards which enable them to protect, preserve and promote their brand, image and enhance reputation by maintaining the authenticity and value of their products. We can offer our clients variety of holographic film, custom holographic film and solutions to deter fraud as we perfectly understand the issues raised by government, industry and commerce on security and authenticity. Although we attend to today's market requirement we also focus on the security demands of the future. Our foils are embedded with sophisticated features that defy duplication and are highly effective visual means of combating fraud. These are also flexible and suitable for most substrate like all type of papers, plastics, PVC etc. We have expertise and a well-equipped factory that can handle the production of sensitive products like holographic film, customized holographic film, , holographic paper and holographic tape. Recognized as pioneers in holographic converting technology in India, Rasik Products Private Limited provides the most advanced optical and material security solutions that are fully adapted to deter the forgery of documents and brand products. Our SH grade hot stamping foil is available in custom holographic film patterns for avoiding duplicacy and fraud of branded product and documents. This can be supplied in metallic and Transparent (HRI coated) holography finish for patch and strip hologram applications. This grade of foil can be used in high security hot stamping application like passports, visas, ID cards ,Credit and debit cards, government documents, bank cheque, demand drafts, pharmaceutical packaging, cosmetic packaging, cartons etc. 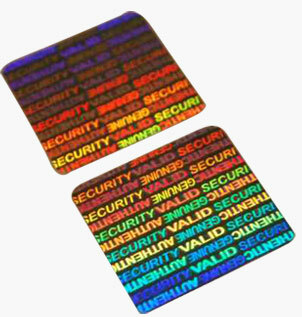 We are the pioneers of hologram scratch foils in India. Our hologram scratch foil is available in different general hologram patterns and customized holography for different types of cards which need the information to be hidden in a more secure manner. Our customized HRI films (Transparent holography) is specially developed for carton industry by which they can laminate the transparent customized holographic patterns to the printed boards/carton to minimize the risk duplication of boxes and cartons in the industry. Our HRI film is having very good overprint ability. After customization of holography clients can print by offset, flexo and rotogravure methods. 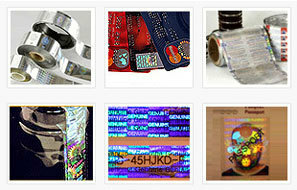 Our Customzsed HRI Films is also available for hot stamping strip and patch hologram applications. As the world is looking for eco-friendly products, we have developed customized holographic paper which is biodegradable in nature and can help to erase the duplicacy from the market. Paper holograms are the future of Hologram industry and we are on the efforts to give customers something different, unique and cost effective through our customized holographic paper solutions.